We're always after people who want to help out. Whether it's out in the field rebaiting and emptying traps, or it's from home helping organise - get in touch and we'll find something for you to do. 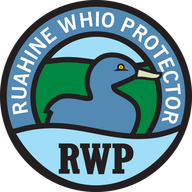 If you are out and about in the Ruahines and you spot Whio, we'd love to hear from you. The more we know about "our" Whio, the easier it is for us to do our job. We need to know time, date, where (GPS coordinates or an approximate spot on a map) and how many. Other details like the number, age (young or old) and health of the birds is handy information for us too. ​or contact your local DoC office: Click here.